The appartment situated on the second floor of a historic building measures 100 square meters plus a 25 meters balcony. It is composed of an entry hall with a fitted wardrobe; two large bedrooms, of which one with a double bed and the other with two beds; television/dining room with a table for four and a sofa with two armchairs; large fitted kitchen with gas hob, electric oven, washing machine, cooking pots and a large quantity of crockery and cutlery; two bathrooms of which one with a bath tub. The appartment is furnished comfortably with 19th century furniture, oriental rugs,and decorated with oriental hangings and pictures. There is a woodblock floor in all three rooms, and a marble floor in the hall, kitchen and bathrooms. visiting. The appartment is centrally heated. Suits two middle age couples, or a couple with grown up children. No pets and smokers. Possibiliy of parking at secured 24 hrs parking. Secured 24 hrs parking within ca 3 min walk. Absolutely wonderful apartment full of character and olde world charm. This apartment was amazing, lovely big rooms but also cosy and warm, we loved the olde world charm, the tall ceilings, wonderful large double doors, antique furniture and artwork, all of which added to the atmosphere of being transported back in time, but with the added bonus of a modern kitchen and bathroom, the tv and wi-fi was also a useful addition. Paulina collected us from the airport and took us back again when the holiday was over, she helped us with the luggage and provided lots of useful snippets of information for where to go and places to visit, she spoke perfect English and couldn't have been more helpful. We wouldn't hesitate to recommend this apartment to anyone . I have just read your review. Many thanks for your kind words concerning the appartment and its "old world charm". I was born in Cracow and imagine that an appartment of my parents must have been looking like this before the 2nd World War, which changed all. Many best wishes for the New Year 2019. Come again, you are very welcome. The apartment was beautiful, spacious,comfortable, warm, well equipped and tastefully furnished in a traditional style. The location was only a few minutes' walk from the Glówny Rynek, the Main Market. We were warmly welcomed and shown around by Paulina, a friend of the apartment owner's. Paulina was helpful and obliging in every possible way. A dossier with useful tips and recommendations for visitors to Krakow was thoughtfully provided. Our only slight grumble was the absence of any German-language television channels among the many foreign channels provided by the cable company. That was a pity, as one of our group spoke no English and none of us spoke Polish. But we doubt that there's a better place to stay anywhere in Krakow. Highly recommended! Many grateful thanks for your review and good words about Paulina. Wy shall look to the question of a German speaking TV channel, though you must appreciate that in the five years' renting experience we had only one German client! Wonderful location for visiting Kraków! Spacious apartment in a central location. Easy access to trams and within easy walking distance to most everything. Kraków is a wonderful city, clean and safe. Paulina was very helpful. We enjoyed our stay in Cracow and at the apartment. Paulina met us at the airport and also dropped us back. She was lovely, spoke immaculate English and could not have been more friendly or helpful. The apartment is well located for tourists on a short trip like we were, with everything we wanted to see being within comfortable walking distance. The apartment is large and the way it is presented has an old world character and charm to it that we liked. Being able to sit out on the balcony with a cup of coffee or a beer was a real bonus. Thank you. Pleased that you enjoyed staying in the appartment. 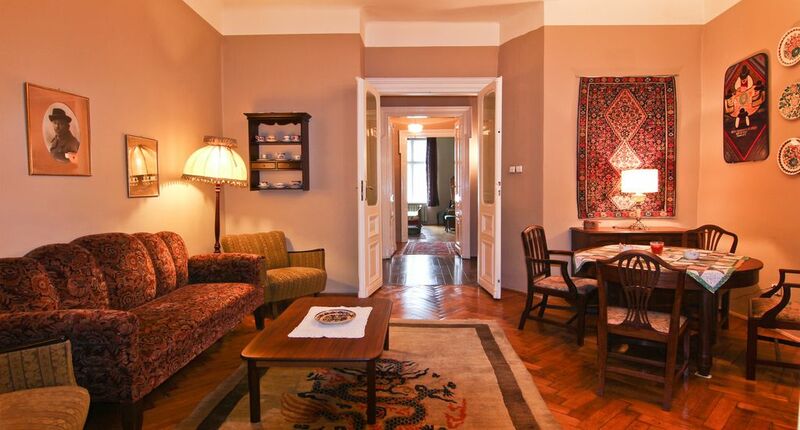 Great location walkable to city center and Jewish Ghetto. Owner arranged transportation to and from airport and we were met by someone to let us in. Overall a nice experience and we enjoyed visiting Krakow. The large, third floor apartment was well-equipped and in a perfect location, within a few minutes walk of all the sights in old town and the Jewish Quarter. Paulina provided lots of useful local knowledge, and transportation to and from the airport was much appreciated. The only downsides were the early-morning trams on the street below (it took a night to get used to the noise), and one of the single beds had a poor mattress. Different rates apply to festive seasons such as Christmas, New Year, Easter and Jewish Festival. Please ask before booking.